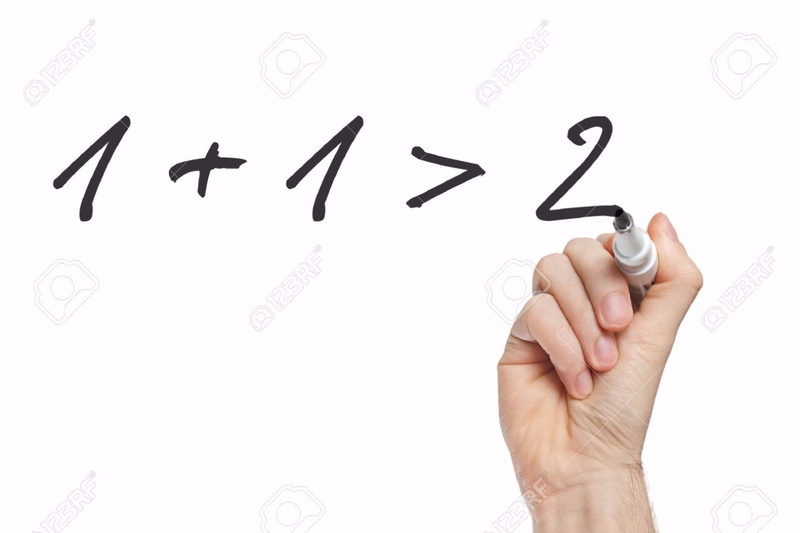 Aristotle's observation, that the whole is greater than the sum of its parts (photo), has been expressed in other terms in many cultures down through the centuries, but the basic idea has never changed and is still the same. It's perhaps more correct to say that the whole is something different than the sum of its parts. This is well illustrated in any true organ music. Just consider the Toccata from Bach's "great" organ Toccata and Fugue in d minor, how it's put together; it's only 30 bars long and arises from almost nothing in terms of raw materials. Just look at it's chemistry! Any time we join the fragile bare components of music together in a creative way like this, whether it's the simplest improvisation at the organ or the most abbreviated written composition, the finished product, when reduced to its elements, may only consist of a few common scales, chords, and arpeggios. But the result, when these things are united according to some regular plan, is no longer merely the sum of its parts. A dramatic metamorphosis occurs, as if by a chemical change ... the ingredients indeed morph into something different and useful, just like highly caustic, explosive sodium metal combines as if by magic with poisonous chlorine gas to create table salt, something that's not only useful but necessary for life as we know it to continue. Here's another analogy: Think of what happens when 2 organic acids are heated together; a combination reaction occurs, a molecule of water is split off, and the product is an ester, typically a very pleasant smelling compound. Naturally occurring esters give fruits, berries, melons, and herbs like a banana their own identifiable odors and tastes, just like fingerprints. It helps us to tell the difference between an orange, for example, and a banana. A banana smells like a banana and nothing else; and it's a pleasant smell. This mixture undergoes a combination reaction to create dibutyl acetate, a very pleasant smelling ester compound familiar to every child. It's what gives a banana its characteristic taste and smell. The simplest, most elementary instruction at an organ bench taken once a week, when added to another brief, simplified lesson, and then another, under the slow heat of an encouraging, supervising teacher, over time creates the same kind of combination reaction, leading to the creation of something within a student that wasn't there before, something different and sustaining and monumental in its potential. We should never be surprised therefore that the combination of a little of this, a little of that, a little of this, in our writing or improvising combines like chemical reagents to create something new and different that wasn't there before ... something with strength and power and love and purpose ... something that's fine and good and lasting and beautiful. No matter how elementary it may sound or seem at first, even if it's nothing more than a simple melody drummed out on a keyboard with a single finger, that's what improvising is all about. No matter how unsophisticated our first attempts at writing seem to be, even if it's nothing more than a simple melody scrawled in pencil on a lead (pronounced "leed") sheet, that's what writing our own music is all about. That's what true organ music, any real music, is all about. It's what composing and improvising is all about. It's about not being afraid to experiment, about not fearing any imagined shame or guilt for mixing the same simple components together in original and different ways that an innumerable company of other musicians also did who have come before us. It has much to do with chemistry, engineering, and biology. It has much to do with courage, exploration, and discovery ... about joining and fashioning something that wasn't there before, something that's far more than the sum of its parts, something that moves, something that seems to have a life of its own. When we work in reverse and take a wondrous piece of music like this apart, our dissection of muscle, artery, and sinew reveals no magic, only the same basic raw materials from nature found all around us ... the same notes, chords, scales, and arpeggios that have been there all the time which, all by themselves, are just themselves.